Your sewer lines are the lifelines of your home. They carry water throughout the house to where you need it, when you need it, and if they get backed up then your whole life can end up getting backed up. If the water in your sewer lines has nowhere better to go, you know full well it’s going to end up somewhere you don’t want it. To avoid the damage that can come from in-home flooding and similar issues, keep an eye out for the following signs before disaster strikes. This might sound peculiar, but what we mean when we say abnormal water reactions is when something in your home connected to a water line does something it isn’t supposed to. This could be characterized by your bathtub filling with water when you do a load of laundry, or your kitchen sink’s faucet flow slowing when you flush a toilet. 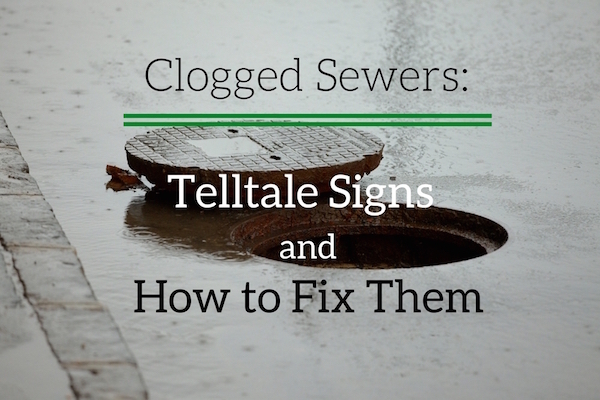 Pay attention to the way the water flows through your home, and if you notice an abnormality it’s a good sign that you have a problem and might need help to fix your clogged sewers. The average person uses the restroom between four and seven times a day. Suffice it to say, you spend a lot of in the restroom, which means that whether you’re conscious of it or not, you know how fast your toilet bowl usually drains. If it’s slowing down, or not completely draining the bowl like it used to, then once again the likely culprit is a sewer clog. This could go without saying, but we like to be thorough. If you’re noticing frequent back-ups in your home drains, then there’s a likely sewer clog. Your toilet will be the first to feel the hurt since it’s most directly attached to the main sewer drain, but as clogs increase the problems can branch out to your sinks, showers, and outdoor drains as well. Keep an eye on the way water flows in and out of your home to keep ahead of the problems clogged drains can bring. It’s good to keep an eye out for these signals, but don’t fret if something has slipped your gaze. If you need help to fix your clogged sewers, the Smell Good Plumbers at Mike Diamond are available to assist you 24/7.